Mealtimes can become an anxious time for you and your loved ones. Food that you have previously enjoyed can now taste strange, metallic or make you feel sick. Your mouth may be very dry and sore from your treatment. You may be exhausted and unable to prepare meals at this time. If you are the person in your family who has normally prepared the meals, it can feel strange to stand back and let someone else take charge. Your family and friends may try to help by giving you suggestions about what to eat or by preparing a meal which they think you will enjoy. You may feel like you have let them down when you find that you are unable to eat what they have prepared. Try not to feel guilty, maybe ask to serve your own portion or tell them that you are aiming for little and often. Eat what you like when you feel like it. Try and be positive about what you have managed to eat rather than worry about what you didn’t eat. What you fancy may vary from day to day so it’s a good idea to keep well stocked up on store cupboard meals and snacks, e.g. instant milky puddings, jelly and tinned fruit, ice cream, savoury snacks such as nuts and crisps, ready or convenience meals that can be stored in the freezer, tinned meats and fish, UHT milk and fruit juice, dried mashed potato, tinned vegetables, packet/tinned soups are all great to have at home. If food tastes bland try experimenting with new tastes; spicy, very sweet or highly seasoned foods, may be more enjoyable. Toasted bread, crackers and rice offer a different texture to plain bread and potatoes. Cold food is just as nourishing and often has less smell so may be more enjoyable. If your mouth is dry and sore soft food will be easier to swallow. Sucking sweets, chewing gum, sucking ice cubes or frozen fruit such as grapes, satsuma or pineapple segments can all be soothing and fizzy drinks may help to keep your tongue free of coating. 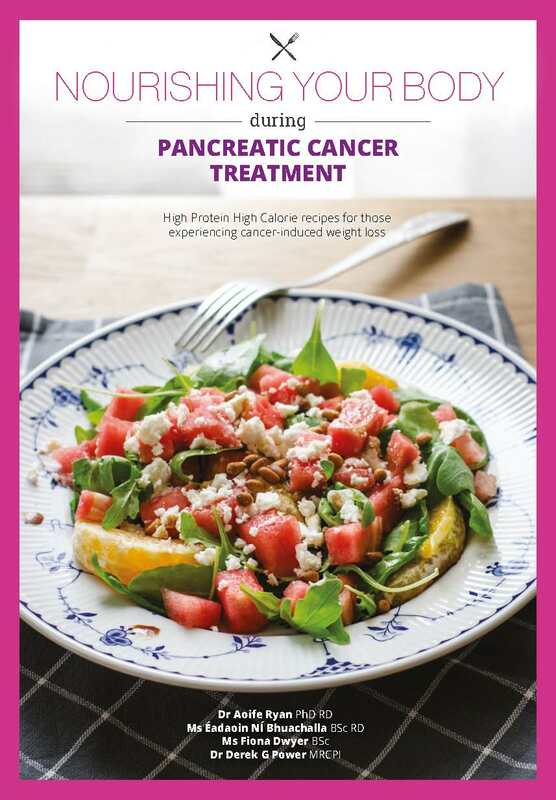 Created by dietitians and chefs at University College Cork, this recipe book provides advice on how best to combat cancer-induced weight loss and other eating related problems whilst undergoing pancreatic cancer treatment. It features over 80 quick, easy and energy dense recipes for nourishing meals and snacks that have been created specifically for people who find it hard to maintain a healthy weight. In conjunction with University College Cork, Ireland, produced and distributed courtesy of a grant from the Rosenfield Family.